An effective cockroach program depends on good sanitation to eliminate the food, water and harborage areas. The use of gel baits and dust are the most effect means of control. Glue traps are helpful but are usually used as monitoring devices rather than control measures. A thorough vacuuming of harborage areas is also very helpful in reducing cockroach populations. 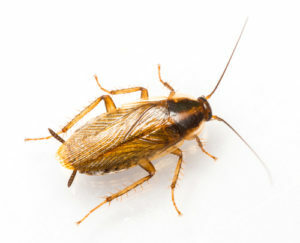 If you’re seeing roaches during the day it is likely that you have a significant infestation in your home or facility. Roaches also leave behind droppings, which can be easily identified as they look like ground pepper or fine coffee grounds and are usually found in drawers or beneath countertops. Roaches, like bed bugs, also like to feel material on their bellies and their backs and will therefore often hide in crevices in your kitchen or bathroom. Using over the counter products in an effort to self-treat will often repel the roaches and cause them to scatter to other areas of your home or facility, making eradication significantly more difficult to attain. A professionally trained and licensed exterminator is your key to long lasting results.